It was Wednesday night when I heard the news Steve Jobs had passed away. Ironically enough, at the time I was using one of his creations to get on Second Life: an iMac. It didn't take too long for word to get around in various SL groups. Among them, the Relay for Life group. Although Jobs' cause of death wasn't listed, it was known he suffered from pancreatic cancer. The group expressed their condolences, and called it another reminder to look for a cure. By the next day, there were some tributes posted on Facebook. 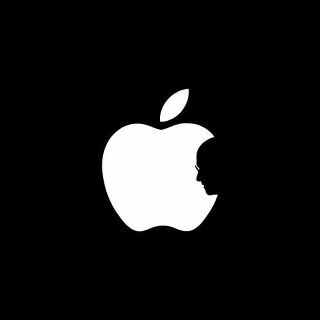 More than once, I saw a modified version of the Apple logo, but with the "bite" now a shilouette of Steve Job's profile. There were others as well. I saw one picture in the news of an iPhone in a Japanese temple showing an image of a flickering lit candle. So what tribute was there in Second Life? I heard about a place called the "Church of Mac" on the grid. Porting over, it looked much like the other buildings in the suburban block from a distance. But up close, one could see the burning torches, the stained glass, the "Church of the Mac" plaques, and most notably a recent picture of Steve Jobs next to a statement, "Here's to the crazy ones, the misfits, the rebels, the trouble-makers ... glorify them or vilify them, the only thing you can't do is ignore them, because they change things. ... We see genius, because the people crazy enough to think they can change the world are the ones that do." Going inside, there was a symbol that looked like an apple with barbed wire wraped around it. There was also a shrine with an old style Macintosh computer on it. There were also a number of images, such of a younger Steve Jobs holding an apple, and a number of noted artworks redone with a Mac computer worked into the scene. The place was owned by a Molly Montale. IMing her, she told me she had been contacted earlier by Hamlet Au, "Our real-life neighborhood is near a large stone quarry. In the mid-twentieth century our neighborhood was full of Italian stone cutters. Many families had religious shrines in their yards. About 20 years ago I saw that someone had replaced the statue of Mary in a shrine in their yard with a Mac Classic. I always regretted not get a photo of it. 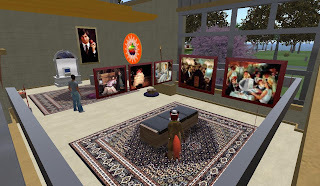 Second Life allowed me to recreate it." Molly told me the Church of Mac had been around for over five years, created to poke fun at the devotion Apple computer fans sometimes express for their brand," I made the church as a light-hearted play on how Mac users, me include, love the Apple products." Following the announcement of Jobs' death, "I was crying like a baby last night reading some of the blogs, so very sad. He was ill for so long. The church has been there for over 5 years. I figured I should put a sign out." So up went the picture of Steve Jobs and the salute in words, "I never anticipated people coming." While we talked, she announced, "Wow! Someone just sent me this: 'On the v2 viewer front page is the destination guide, and a few featured locations. The #1 featured location is Church of Mac.' Wow, I am speechless. I wish I had put better stuff out. I had no idea people would actually go there." Molly plans to do a few changes in the inside. Although the place is now a shrine, it will continue to be called "The Church of Mac." The Church of Mac is on the Blumfield sim at (154, 146, 26). One can see a few more tributes to Steve Jobs, in the article: Here. As a Mac owner and a user of Apple computers since the old Apple2, I too am saddened by the passing of Steve Jobs. Although he didn't invent the exact things he sold, much like Henry Ford decades ago he marketed them in a way that opened them to a mass marketplace. Although he clearly will be missed, there are reports he had his input in various projects that will be released in the next several years.